It’s no coincidence that our five picks all come from women designers. Who else understands a woman’s need to look great in clothes that offer a full day of comfort? Who else appreciates a woman’s love of a classic style to accessorize dressy or casual? We all know that our clothes have to be travel-friendly, easy on the wrinkles and washable too. Mostly, it’s a must to be able to mix and match outfits all year round. That’s why we are so thrilled to share these standouts with you. In a perfect world, there’s the perfect top. Here it is. This is a Tee to relax in. The Sympli Go To Classic Tee Relax is Sympli’s unique approach to a top being all that it can be. This 3/4-sleeve top can be worn on its own or as an over or under layering piece. The colours are absolutely dreamy and there are so many colours to match your personality. The scoop neck shows off any necklace and the slit on the side is a chic detail we love. At Evelyn & Arthur, we carry brands we know our customers will love. Lisette L Montreal has officially released a new fabric...DENIM! The same fabulous fit of the pants we all know and love, only now available in denim. How great is that? Of course, the pull-on feature stays with no zippers or belt loops. The Lisette Betty Pant with Pearls has front and back pockets and its ankle length to show off your shoes! With an on-trend unfinished hem and a fun scattered pearl detail on the bottom, these will put all eyes on you. We can’t wait for you to try them! Unlike any Planet Blouse we have ever seen, the new Planet Tissue Box Jacquard Circle Blouse has so much going for it. With a sassy stand-up collar, it’s fashion forward with a much larger button detail. Here’s an A-line blouse that features a large tissue box shaped pocket along the left side, a high low hemline and a side slits just for fun. You look long and lean in this one. It’s time to wear your style on your sleeve. This top sees no evil, hears no evil and speaks no evil. But it does say a lot about your good fashion sense. Introducing the Lisa Todd Hear No Evil Top. The comfy 100% cotton top has the novel graphic on the lower left arm. 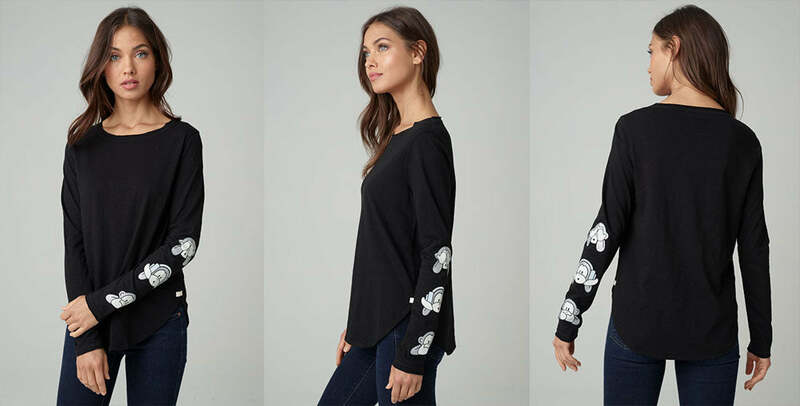 Besides the familiar graphic, the top is a basic long sleeve top with a U-shaped Hem and crew neck. Lisa Todd is luxury with a wink, and we just love her ‘conversation piece’ designs. Have some fun and spice up your all-season wardrobe with some Lisa Todd whimsy. As you may know, we are big fans of Sympli. What’s not to love? Sympli is all about comfort and effortless fit. Sympli tops are so easy to wear, made from the softest, smoothest fabric you can imagine. The Sympli Lounge Top has a special edge of sophistication with its V-neck and center front seam. It hits low at the hip, a look that makes it a fashion hit. Did we mention Sympli is machine washable? Talk about having it all! As we browse through our huge selection, these five staples are the ones we recommend that will take you anywhere, any time of the year. All designed by women with you in mind!